God’s love leads us to take a deeper look inside to see the true state of our hearts. The medical world provides a good example to follow. If we suspect something is wrong with us physically, we allow a medically qualified caring person to examine us. We submit to various tests until a diagnosis is forthcoming. Then we receive treatment. What about our souls? Old time pastors spoke of “the cure of souls”. This has now been largely replaced in our modern society by psychology. When we feel dysfunctional in some way, we think of going to a counsellor. They are trained to spot problems. But are they really equipped to deal with the deeper issues of the soul? We are grateful for the fine work psychologists often do, but, as believers, we are concerned to bring God’s solutions to bear on our problems. Clearly this is beyond the scope of the secularists who often dominate the caring professions. Even for us, however, the danger is always superficiality. Christians are often guilty of sticking plasters on deep wounds thinking that a scripture verse here, or a platitude there is sufficient. It usually amounts to: “Shape up your life, and your problems will go away.” The advice is often: “Just praise God, get prayed for or cast out that demon”, or simply, “Change your behaviour!” This form of superficial response is in fact far removed from the true teaching of the Bible and can do more harm than good. As we saw last month in the first part of this article, the foundation of all true spiritual health is love. The love of God fully experienced and lived is the goal of the Christian faith. So how do we grow in this love? How do we avoid superficiality in the spiritual life? The answer is to allow God to probe your heart and expose what is not helpful or consistent with the life of love. Beginning with the deeply felt love of God, we can learn to trust God to show us where we need to change and to grow spiritually. There are three ways he probes our lives to expose what needs to change and we must give equal emphasis to each of them. These are God’s Spirit, God’s Word and God’s people. If we are moving in the true love of God we are not fearful of his presence but openly invite him to examine our hearts. The Psalmist got it right when he said, “Search me, O God, and know my heart; try me, and know my anxieties; and see if there is any wicked way in me, and lead me in the way everlasting.” (Psalm 139:23-24). This is an open invitation for the Holy Spirit to probe our hearts. We need his help, because we so easily deceive ourselves, defensively denying what is wrong with us. We can even sincerely think that everything is as it should be, but we can also be sincerely wrong. That is why we need the Holy Spirit to search our hearts. This Psalm addresses the deepest issue of our hearts – idolatry which is offensive to God. The “wicked way” is also the “worthless way”. It points to the empty idols we pursue in the mistaken belief that these substitutes for God will provide for us what only God can provide. Our behaviour is nearly always motivated by our beliefs. We pursue with passion those things that we believe will most deeply satisfy us. But as the Holy Spirit deals with us, he gently reveals those idols of the heart and encourages us to abandon them and to trust God alone for the satisfaction we crave. He teaches us that his way is best. He leads us to place God’s will above our own and exchange our values for his. This takes faith. Faith that God has our best interests at heart, and that he gives us his best in his own way and in his own time. Trusting God when we feel like going in the opposite direction is a vital sign that we are growing spiritually. Can you point to specific areas of your life where you deliberately chose not to do what you really felt like doing because you followed God’s will rather than your own? If so, you can be sure that your spiritual life is going in the right direction. 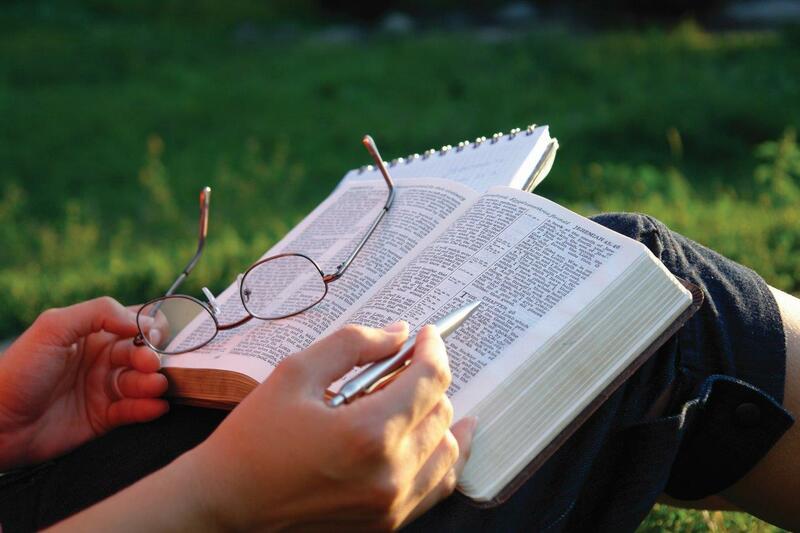 God’s Word, the Bible, is more than a collection of ancient sacred writings. It is the living Word of God and it is powerfully active in all who receive it: “For the word of God is living and powerful, and sharper than any two-edged sword, piercing even to the division of soul and spirit, and of joints and marrow, and is a discerner of the thoughts and intents of the heart. And there is no creature hidden from his sight, but all things are naked and open to the eyes of Him to whom we must give account.” (Hebrews 4:12-13). Part of the process of spiritual growth is to submit yourself to the razor edge of the Word, allowing it to cut open and expose the secret thoughts and intentions of the heart. And, out of that experience, you learn to follow God’s direction from the heart, with pure motives. You begin to yearn for the things that bring God glory. You know these will lead to your ultimate good, even if you feel desperately unfulfilled in the meantime. Thinking and acting in this way is a sure sign that you are moving towards spiritual maturity. Please notice that this is not just about superficially quoting scripture to yourself or others. It is about nourishing your soul on the Word of God, deeply and it does not always give you slick answers. You need to give God time to probe deep into your heart as you open yourself increasingly to the truth of God’s Word. All this depends on your prior commitment to the authority of the Bible. It does not help if you think the Bible is only one option among many when seeking God’s will for your life. I have found, both in my own life and with others whom I have tried to help, that we can easily talk ourselves out of the clear instructions of scripture. “It’s too hard”, we object. “I tried that and it doesn’t work”, we protest. “Surely God considers my special circumstances and he understands that this doesn’t apply to me”, we argue. But if we really want to walk with God, we must be committed to obeying his Word and accepting it as the sole rule of life. It is after all his love that leads him to reveal his good will and best intentions to us. Follow the Word and you will not go wrong. Another way of probing beneath the surface is genuine Christian fellowship. The writer to the Hebrews expresses it like this: “Beware, brethren, lest there be in any of you an evil heart of unbelief in departing from the living God; but exhort one another daily, while it is called “Today,” lest any of you be hardened through the deceitfulness of sin.” (Hebrews 3:12-13). It is difficult for us today to grasp just how powerfully the Holy Spirit works through one another. We are used to the superficial relationships so prevalent in our individualistic society. Even in the church, fellowship is often no deeper than, “Hello, How are you?” And then comes the response, “Fine thanks. See you next Sunday!” In Kensington Temple, London City Church, we encourage everyone to be part of a small group where deep and meaningful relationships can develop. This is what the writer to the Hebrews has in mind. He describes the kind of connection believers have with each other that is both spiritual and practical. It is spiritual because our fellowship is of the Holy Spirit and it is practical because true fellowship encourages movement toward God. It shows us what is lacking and inconsistent in us and also reminds us of who we really are lovers of God. When we are committed to the spiritual wellbeing of one another we are not content with merely social relationships and small talk. Our conversation is directed toward exploring one another at a level of depth. The conversation is geared towards edifying one another. This involves genuinely getting to know one another, without pretence. It avoids judgmental or super spiritual talk and exposes our passion for Christ. The things that need confronting or changing are revealed as by-products of this process. When our passion for Christ is exposed, then the wisdom to follow him is also released. The wisdom of the Spirit rests in each one of us and the joy of Christian fellowship is the way the Holy Spirit uses us to encourage, exhort and enlighten one another. This is the ministry of the Spirit through the Body of Christ. If we really want to check out our spiritual progress we will be open to these three ways of probing beneath the surface to get to the gold and remove the dross which clogs up our lives. True spirituality is never stressful. It is never a matter of sheer grit or self-effort. It is always by the Spirit who is always moving in our hearts and in our Christian community. As we move forward into the years that lie ahead, there can be no doubt that God wants to deepen the spirituality of his people. The only way we will stand in a society that is shifting further and further from God is for us to move ever closer to him. This means we must take stock of our spiritual life and co-operate with the Holy Spirit who is calling us to higher and higher levels of spiritual growth and maturity.